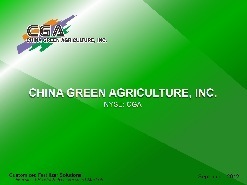 China Green Agriculture, Inc. (‘we” or “the Company”) is primarily engaged in the research, development, production and sale of various types of fertilizers and agricultural products in the People’s Republic of China (“PRC”) through its wholly-owned Chinese subsidiaries, Jinong Shaanxi TechTeamJinongHumic Acid Product Co., Ltd. (“Jinong”), and Beijing Gufeng Chemical Products Co., Ltd., (“Gufeng”), both of which are engaged in fertilizer production. 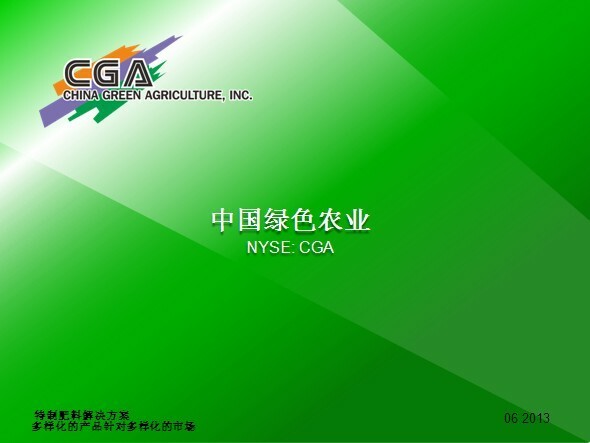 In addition, we operate through variable interest entities (the “VIEs”), including Xi’an Hu County Yuxing Agriculture Technology Development Co., Ltd. (“Yuxing”), engaged in agricultural products production, and another eight VIE companies that we acquired since June 2016. Our primary business is fertilizer products, specifically humic acid-based compound fertilizer produced through Jinong; and compound fertilizer, blended fertilizer, organic compound fertilizer, slow-release fertilizers, highly-concentrated water-soluble fertilizers and mixed organic-inorganic compound fertilizer produced through Gufeng. In addition, through Yuxing, we develop and produce agricultural products, such as top-grade fruits, vegetables, flowers and colored seedlings. For more information, please clink on the link below to see a copy of our corporate presentation.